THIS BUS TRIP IS SOLD OUT! THANK YOU FOR YOUR INTEREST AND SUPPORT! Price: $119 per person (HSRC members); $129 per person (non-members). * Includes bus transportation, docent guided tour, a deluxe luncheon coupon, tips and an all-museum pass. 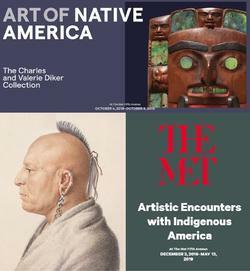 Our day will begin with a docent-guided tour of "Artistic Encounters with Indigenous America" and "Art of Native America: The Charles and Valerie Diker Collection." These exhibitions explore how European and American artists represented Indigenous North Americans in drawings, prints, watercolors, photographs, and popular ephemera from the seventeenth century to the early twentieth century. Through forty-five examples from The Met collection, the display traces the evolution of this complex imagery over time, highlighting the ways in which it contributed to the creation and dissemination of myths and misconceptions about Native peoples, often justifying their dispossession, cultural destruction, and genocide. From formulaic depictions of so-called savage warriors and Indian princesses to romanticized representations of a "vanishing race," these works reveal the pervasive influence of Indigenous America on the Euro-American imagination. Then we will dine in the MET cafeteria with a lunch that includes your choice of entrée options (salad bar, sandwich, pasta, grill, or main course stations), dessert, and soft drink or coffee. After lunch, you will be free to explore the entire museum at your own pace. Enjoy the superb, extensive permanent collection or one or more of the other special exhibitions, including "Jewelry: The Body Transformed"; "Epic Abstraction"; "Monumental Journey: The Daguerreotypes of Girault de Prangey"; "The Tale of Genjii: A Japanese Classic Illuminated"; "Camp: Notes on Fashion"; "Seeing the Divine: Pahari Painting of North India"; and "The Art of London Firearms." * Please note that the final trip price differs from the one advertised in the recent Save the Date flier due to the addition of the de luxe lunch coupon. We apologize for any confusion this might have caused.